Growing up in the area, Strafford Mo., actually, I can remember my mother and father visiting some friends in Hermitage and crossing the dam before water started filling it. There were a lot of bulldozers piling up trees and a lot of fires were burning those away. After graduating from high school and finding out I was way too smart to go to college I entered the Navy. Upon getting out of the Navy I worked around Springfield for a few years and then went to Kansas City, Mo. where I took a $10 bet from a friend and tried to get on the KCMO Police Department, I won the bet, best bet I ever made, and found something that I really enjoyed. I spent 30 years on the KCMO Police Dept and 20 of those years were spent in the Canine Unit. A couple of years after joining the Department I met and married my wife and fishing partner, Mary. We raised three great kids, Theresa, Earle #3, and Tommy. They all spent a lot of time at Pomme with us in our camper and at Martin's Lakeside Resort. Our stay at Martin's was made even better, when we would stay there we always went home with a lot of veggies from their garden, which we really appreciated, Martin's Lakeside Resort is currently known as Anglers Resort. My wife always told the kids not to get married, have kids or anything else during the muskie tournament because their dad would not be there. 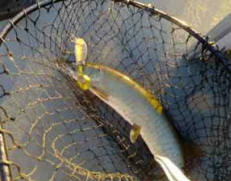 I did not miss a tournament for 30 years, I did miss one when I took a trip to Canada in October to fish for 50"+　muskies. What a trip, living on a 68' houseboat for ten days, took one the following year also but this time the trip was a week after the muskie tournament. I did finally go to night school while on the Police Department and did get my degree. I have also had the honor to meet every President of the USA from L.B. Johnson to Ronald Ragan. I even had a chance encounter with Pres. Jimmy Carter one night while working an off-duty job at the Muehlebach Hotel in downtown KC, we talked for about 10 minutes, he was (still is) a very nice man. After retiring from the Police Department I worked at the Federal Reserve Bank in KCMO and all this time I never stopped fishing for muskie and other species. While at the Fed we bought a 5th wheel trailer, after the kids all vacated the house, and　parked it at the Harbor, at Pomme de Terre, for a couple of summers. We sold it when we bought a house on the lake and moved down here permanently. Mary and I both enjoy living down here and looking out from our deck and watching the fish hit the surface of the lake down below us. I am　currently the Senior Regional Representative of Region 4 of Muskies, Inc.　and have been for the past 12 years, a job I truly enjoy. I guess I am just a MUSKIE FANATIC!!!!! Not really much of biography but I wanted to catch up on my typing. I do usually fish almost everyday,,,,,,why would we have moved down here otherwise. I am also 1 of 12 Regional Directors for Muskies, Inc. an Nationwide Muskie Organization with　6,500 members.. 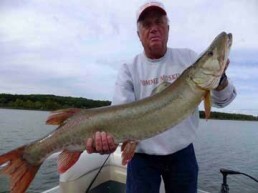 I also do the website,Missourimuskies.org and I was the editor of the newsletter MoMuskies News. I also do fishing reports for the KC Star and other newspapers in the area. I am also PawPaw to Matthew, Colton, Meghan, Mason and Graden. Colton Hammond is the first baby born in the Liberty, Mo. Hospital this CENTURY!!!!! I find it hard to believe that Colton is now 16 years old and driving! !